Twelve tracks, all of them more than familiar. The trio of Alex Thompson, reeds, Nathan Lawson, guitar, and Dylan Thompson, drums, will need little introduction to those who follow the Tyneside jazz scene. They’ve been gigging as a trio and in several other bands for a couple of years or so. In Other Words is the name of their band and in December of last year they spent a day at Blast Recording Studios in the Ouseburn, Newcastle laying down the tracks that make up this album. Watermelon Man opens the CD and Neal Hefti’s Li’l Darlin’ closes it. Ten other varied tracks give an indication of what they can do. The brisk opener is followed by Dexter Gordon’s Cheese Cake and if you didn’t know of their individual and collective abilities before listening to the CD then by this point you most certainly will! On In Other Words Alex plays alto saxophone and clarinet demonstrating a command of the tune, developing sinuous solos, all the while respecting the melody. Guitarist Nathan comps effectively and solos fluently across a range of material. Dylan, the youngest member of the trio, has shown Tyneside audiences what he can do and now he’s put it down on CD. A Foggy Day and Goodbye Pork Pie Hat are considered, beautifully crafted pieces, Caravan and Chameleon are the fun time tunes, the three musicians in the groove, enjoying themselves. Two unexpected numbers make the cut; Strangers in the Night works surprisingly well, and a duo feature for Alex playing clarinet alongside Nathan’s guitar on Do You Know What it Means to Miss New Orleans? is one of many highlights. Alex stays on clarinet as Dylan picks up the brushes for the final, aforementioned number – Li’l Darlin’ – ensuring the trio does justice to a timeless tune. If you didn’t know who these three were you’d never guess they’re still at school. Alex Thompson plays a mean saxophone, clarinet too. Brother Dylan Thompson is a real prospect. A drummer of immense promise, if he really wants to make it there’s nothing stopping him. And guitarist Nathan Lawson knows all the chords. In Other Words gig around town and further afield and now they’ve released a CD it could well encourage regional promoters to offer them a gig. 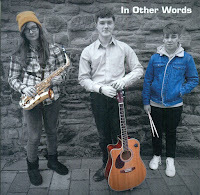 Follow In Other Words on Facebook – www.facebook.com/inotherwordsuk – and be sure to buy a copy of their new album!